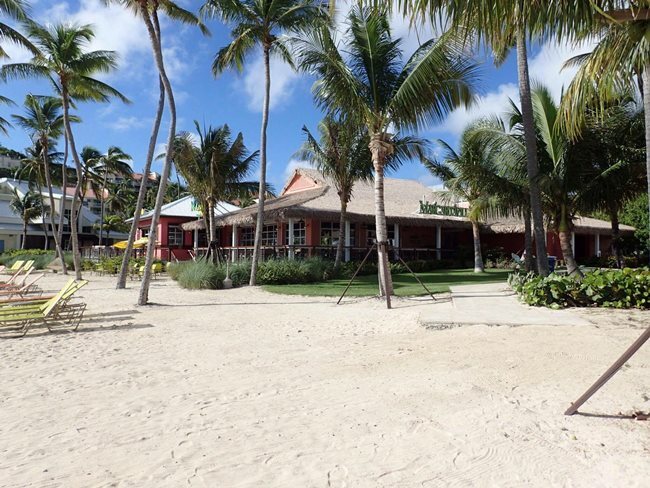 The Margaritaville Restaurant on St. Thomas is one of chain of restaurants inspired by the music of Jimmy Buffet, located at the Margaritaville Vacation Club in the US Virgin Islands. I wasn’t expecting much from a chain restaurant that is so heavily themed, and was initially put off by the glorification of alcohol in the island music of Jimmy Buffet’s songs. The resort bar next door is titled “Five O’Clock Somewhere”, a hit song title and unconvincing rationalization for being day drunk. However, the Margaritaville Restaurant became our favorite restaurant on our Caribbean trip, and the only restaurant we visited more than once. We actually visited three times, once skipping a free dessert at a nearby restaurant to come to Margaritaville and watch the sun set over dessert and drinks. The restaurant, like the resort, is perhaps too heavily themed, but is cute in its earnestness. For example, the tables have a clear glass top with photos from Jimmy Buffet’s albums. The inside of the restaurant is themed as though you’re on the beach outdoors, with each entrance into the room decorated like a thatched hut. There’s a surfboard and dive shop theme to it, with a small performance stage. Slogans from Jimmy Buffet songs caress you to “Take a break,” and say that life is “Nothing but a breeze”. However, it’s nice that the televisions, which run vacation footage, are above one’s eyeline. So you can look up at them if you wish to, but they don’t distract your peripheral vision if you (and I would hope) prefer to chat with your friends or family instead. We were glad to hear a live band play, but then realized that they were playing TV theme songs of the 1970s, including The Muppet Show. The theme from M*A*S*H is “Suicide is Painless”, which is a song of mourning that is dissonant played upbeat on bright steel pans. In the corner of the restaurant is a tiny but ostentatious gift shop. However, the views were incredible on the outside deck, which is less themed. There you’ll look out over palm trees, the beach, and Water Bay to the ocean and distant islands beyond. If there’s a better view in the whole world, I don’t know it. It will relax even the fiercest resistors of relaxation. On the outdoor deck you’ll have a space all to yourself, facing the breeze. It was a shame that by the time they officially began serving dinner at 6pm, the sun was already setting, extinguishing the long views outside. (Because artificial light interrupts the rhythms of sea turtles, you won’t see much after dark.) Our orders were taken and served efficiently, and the hostess came out to chat with us. As I said, our expectations were low for a themed chain restaurant, where the lunch menu says that if you can down a quadruple cheeseburger in 8 minutes, it’s free. But the dinner menu was sophisticated, featuring Caribbean and seafood specialties. Appetizers included a tropical citrus salad, black bean hummus, Ahi Tuna Stack, and the Beggars Purse, which is a Jerk chicken spring roll. For dinner, find Guava Glazed Lamb Chops, Lobster Ravioli Newberg, or a Tijuana Shrimp Scampi. Every course at the Margaritaville Restaurant wowed us with presentation and taste. The appetizers, the main course, and desert were full of surprises, taken to the level of fine cuisine. We ordered a strawberry banana smoothie, which you can get virgin. It comes in a decorative glass, and was a bit too sweet, but went down real easy in the heat. We ordered a number of these smoothies and our server was accommodating about getting the sweetness just right in following glasses. We also had a mango margarita, and it was perfect, neither too sweet nor too bitter. You didn’t really need it with salt, and it didn’t have a strong alcohol kick to it. It has more of like a fruity drink taste, where you’ll notice a little pinch of alcohol. We also tried the Volcano Nachos, a giant plate with a mountain topped with guacamole, sour cream, chicken, and jalapenos. The cheese was addictively tasty, goopy but delicious, making the plate a messy delight. For the rest of our vacation, we kept joking about how we must return to the Margaritaville Restaurant just for those nachos. The West Indies Jumbo Lump Crab Cakes come decoratively presented on an elongated, rectangular plate in an orange mango and pineapple salsa, with chutney in the middle, and a lime wedge. The sauce is hot like wasabi and has got a hot, thrilling kick to it. The breaded crab cakes look lightly fried, a bit crunchy outside, but very soft and moist on the inside. This appetizer was also addictive, the kind of food that you’ll find yourself daydreaming about the next day. 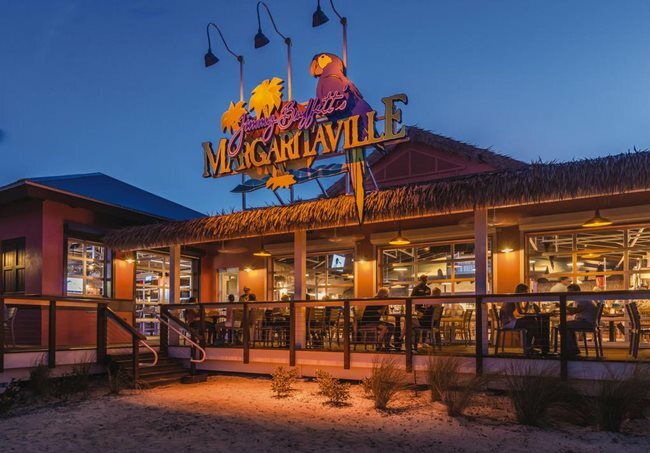 Three weeks later as I write this, I am still craving a return to the Margaritaville Restaurant, and I’m someone who doesn’t drink alcohol at all. The main courses were just as good as the appetizers. The Cajun Jambalaya is shrimp, chicken, and sausage in dirty rice with broth. It comes on a wooden cutting board in the shape of a guitar with the Margaritaville slogan. Notably, the sauce comes in a little metal pot that looks like it came right out of an oven. So the sauce is separated from the rice, keeping it fresh and not soggy. You can spoon the sauce onto your rice, or put your rice right into the pot to keep it warm. It’s got so many textures and layers. It’s just a delicious spice. It’s not overwhelming — you know how some meals make a competition out of how spicy they can get — but it’s just piping hot and very interesting. The rice is of the highest quality, interesting even without the sauce. The chicken melts in your mouth with hardly even needing to chew it, making us wonder whether it’s been boiled. It’s just really juicy. This is absolutely the meal to get. The jambalaya was so good that I checked to see whether anyone was looking and then licked the plate! We also tried the Caribbean Seafood Pasta, which is shrimp, lobster, grouper, mussels, and crab meat with linguini pasta in a cream sauce with cherry tomatoes and red peppers. Just the smell of this dish is amazing. It’s warm, and decoratively arranged with the muscles on the outside, a circular plate, and then the linguini and all of the seafood in the middle, with a lime. It’s got shredded fish on top and diced tomato. Pasta is naturally heavy, of course, with carbs, and you don’t want it made worse, which is why I normally avoid cream sauces, but this basil pesto was creamy but not too rich. The shrimp is cut up into pieces, which is nice, so that you’re not picking apart whole shrimp pieces, and perfectly cooked with a good bite to it. And the fish pieces are so tender. You hardly have to do any chewing. It just melts in your mouth. The Filet of Mignon is a prime steak with garlic and shallots, smashed red potatoes. It’s decoratively piled up onto a circular plate. There’s a base of potato, then the filet mignon itself, then on top of that, a wine reduction sauce, surrounded by grilled asparagus, which are cooked just right to still be crisp. There’s a great meat chew to it, and it’s hearty, like you’re getting energized. This meal had perhaps too much butter and not enough spice. For dessert, we had the Bananarama, a banana rolled and fried inside a soft tortilla shell, served with chocolate sauce and vanilla ice cream. It’s presented on a round white ceramic plate with the banana pointing straight up like a skyscraper. It’s more of a crepe than a spring roll, and the chocolate, to us, was too bitter and overpowering. However, we could see how it might be to the taste of others. Overall for a fried dessert it was not too greasy, and the ice cream was high quality; one can tell that there’s more air in it than typical ice cream, giving is more of a smooth mouth feeling. We preferred the key lime pie, which is to die for. You’ll wish it will never end. It comes in a round, white, ceramic plate with a raspberry drizzle. It’s so tangy, with a sharp citrus smell, and a graham cracker crust bottom that is thick enough to provide a base to offset the acidic citrus. The Margaritaville Restaurant was a delightful surprise. The theme was a touch too cheesy and chain-like, and alcohol shouldn’t be promoted as the answer to life. 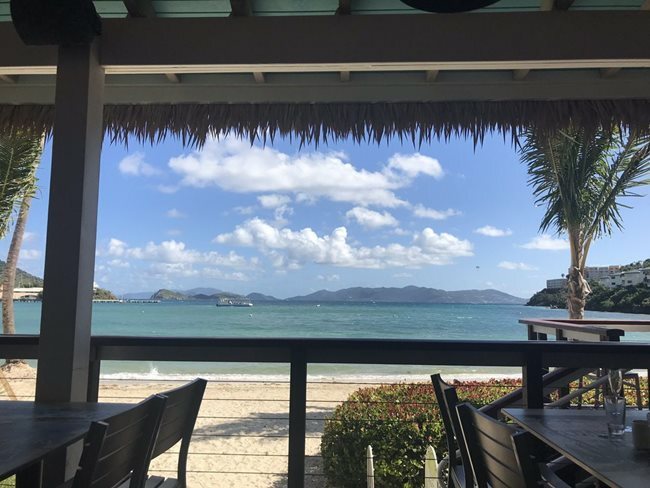 But the views are extraordinary, and it was the only restaurant on the island we found that nailed their appetizers, main courses, drinks, and desserts. The food is so good that they do not need a second restaurant at the resort. The hospitality and service at Margaritaville Restaurant were perfectly comforting, so much so that I briefly forgot that I do not actually live at Margaritaville! I felt so at home that even stray thoughts of worry and my own home left my mind. That deep comfort is the essence of Margaritaville, both the resort and the restaurant. 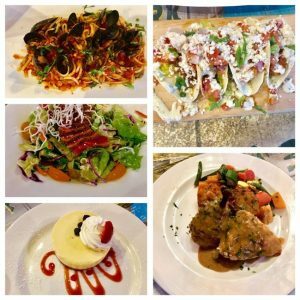 I am glad to call the Margaritaville Restaurant the best restaurant on St. Thomas with my rare five stars PLUS. 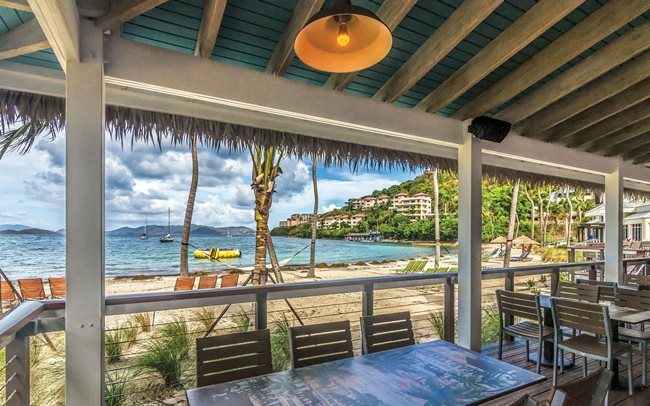 No other restaurant is the US Virgin Islands has this combination of view, service, and food in all categories: appetizers, drinks, entrees, and desserts. See margaritaville.com/dine and read my review of the Margaritaville Vacation Club Resort (5 stars).